I Need to Take These Nice People Home with Me Because They Don't Scowl When a Camera Comes Near Them. Except Then I'd Need a Kosher Kitchen. | Do Try This at Home: I Need to Take These Nice People Home with Me Because They Don't Scowl When a Camera Comes Near Them. Except Then I'd Need a Kosher Kitchen. I Need to Take These Nice People Home with Me Because They Don't Scowl When a Camera Comes Near Them. Except Then I'd Need a Kosher Kitchen. Last week was tough, tough, tough. Nothing really so very horrible happened in the grand scheme of things but still, it was just one of those weeks that left me wondering if maybe that survival instinct is overrated. I mean seriously, giving up would just be so much easier sometimes. In fact, I lost my entire sense of humor right around Monday of last week and it didn't come back full force until Thursday or Friday, so that makes for sort of slim pickins blogging-wise. But I had a lot of fun with these nice people! And then that Sweet Pea O' Mine came through with this sign. Things were looking up! It's amazing how firm we are in our belief that chickens enjoy being eaten. 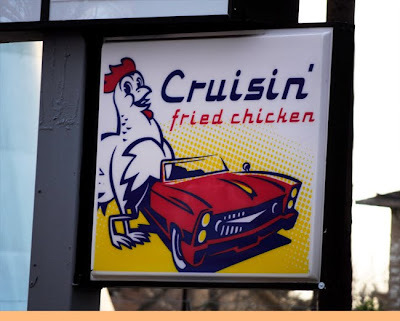 Because nothing says cruising and fun like being fried up for someone's dinner! On Thursday we welcome The-Guy's mom to Texas after living her entire 89 years in the Washington DC area AND only five weeks left on the count down to the Master's thing AND my kids smiled for the camera! This week looks good so far! I need a giant mustache. I think chicken tastes so much better without the smell of motor oil and grease but then that might just be me. Sorry last week sucked for you. I have only had days that majorly sucked, not a whole week!!! Now about your comment on my blog....I was like what the hell is she talking about, lol. SJ - You'd think, right?!?!? Ha! I love your purple wall and I'm pretty sure that mustache belongs at my house. Add friends to the mix and the kids will generally come around. Love the mustache. That giant mustache is brilliant! Jill, sorry you had a tough week last week. Hopefully this week will continue an upward trend! Love the pics of the kids. That can make anyone smile!! What a fun photo shoot with the kids!! And love that mustache! Thanks Janette, Pat & Leilani! I actually put that one up because my boy wanted it - it is a lot of fun! Nicki - Yeah, I've never had them just WANTING their picture taken! It was great! Thank you Samantha! So far so good with this week & we did have a lot of fun! I'm looking at these pictures, and you know what's crazy? That I've known your family for years. I've known your daughter since her Bat-frickin'-Mitzvah! Giant Mustache for the win!!! Thanks Cid!!! That one was all my boy's idea! I have often wondered who would actually want to eat a placed called "Pollo Loco". Which is a chicken franchise around here. I mean seriously......'Crazy Chicken'?